It could be the white linen duster worn in Spain to keep the uniform at least somewhat clean. My thought too. But I think dark blue trousers with red stripes--coupled with a musket--eliminate the Westies. …for those who can't be troubled to hit the link! 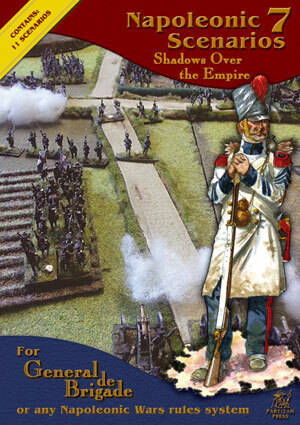 Since i'm painting up loads of Calpe Prussians at the moment for 1813 i'll be getting that. From the names (central Germany) and year (1813), I would surmise the picture is of a French infantryman. But I wouldn't bet any money on it since we all know that the cover art doesn't necessarily convey what's inside. "Cover illustrators can't read. Blurb writers CAN read--but have not read the book." --Old saying among those of us who seek our science fiction in books. There are some prints out there that show Westphalian grenadiers wearing dark blue trousers with red stripes (Google "Westphalian Napoleonic Uniforms" and select "Images"). What about the unusual falling red plume? I see it, Extrabio, but I don't believe it. I couldn't swear that no Westphalian grenadier ever wore through his trousers and scrounged up a pair like that. A lot of odd things happen when you get far enough from a depot. But a company? Or as an issue item? No. Artillery only, and lucky to get enough indigo for facings--or that "cornflower blue"--otherwise. The falling plume is another thing that makes me think France. Something old in a depot, scrounged up when all those 4th battalions went to Spain, maybe? Is he wearing an apron? Could he be a pioneer? Perhaps it is just an artist conception, not an accrual unit. Dark blue center to the grenadier epaulette would be most unusual. Appears to be a smock worn in warm weather, but odd to see chevrons, blue cuffs, etc. Might anyone know how to reach the publishers, and ask them? I may have to eat crow over this one. I was figuring a duster of some sort--better decorated than most. It appears to divide just to the viewer's left of the musket, which spells duster to me. But if it is an apron--then, yes, probably a Westphalian pioneer. Either 1st Regiment in Spain or anyone in Russia when the dark blue facings had become universal, though I still don't believe those trousers were an issue item. Plume still looks odd, of course. You realize, there's a decent chance this is copied from some sketchbook and the original artist wasn't that accurate? For me, the white garment seems to be a kind of greatcoat, not an apron (which would be closed in the front). However, I never saw a greatcoat with coloured cuffs ? Generally, I have the impression the artist just wasn't very well informed about Napoleonic uniforms. Still, he paints much better than I ever could. Does anybody know of a nation which had blue anciennity chevrons ? And caporal lace in blue ? Does anybody know contemporary evidence of shako covers being worn with a pompon or plume ? In my eyes, the hole in the shako cover which would be necessary to fix this pompon, would spoil the desired effect to protect the shako from rain and humidity. I've seen those blue chevrons on Westphalian uniforms, but (a) the ones I remember best were secondary sources, so may be someone's guess work, and (b) all the uniform stuff is out in the garage, and it's cold and raining, so I am NOT going to search for it. I'm about out of dry jackets. But it makes sense--a good contrast color on a white uniform, and the more so once the line all went to dark blue facings.